Surplus Ammo cans directly from a famous Ammunition Manufacturing Plant now available! Surplus Ammo Cans meet a broad array of storage needs and are ideal for transporting ammunition to the range. This is also an excellent way to store your ammunition inside your home for longer-term needs, just keep your ammo inside of this can in a cool, dry location! These "Like New" cans are in great condition with good seals! Please see some of the attached pictures for examples of their condition. Some of these cans have original military markings that have been spray painted over by the ammo manufacturer and there are also some minor scratches on the exterior of the cans. Excellent Prices..... In the words of Arnold, "I'll Be Back"! 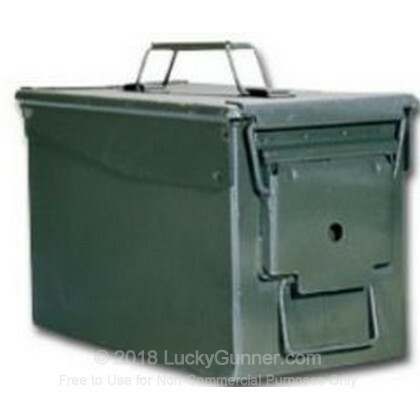 I ordered two of these ammo cans for storage of my ammo. They arrived from LG in only a few days and they were in excellent condition! For the price these are great for storing just about anything and the rubber seals on these cans were in excellent condition also. Will buy more in the future! Excellent ammo cans in excellent condition with fast delivery service. 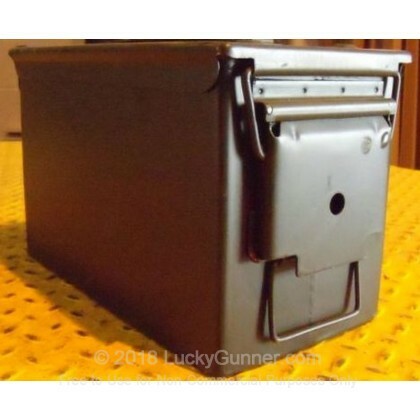 Purchased 3 of these ammo cans to store ammo by caliber. The ammo cans looked brand new. The rubber seal was tight, no signs of rust, stacks well, and locks firmly when closed. What else can you ask for! A great way to store ammo and small shooting accessories. My were in great shape--these and Lucky Gunner are a winning combo. All cans came clean, like new. One was bent, I called customer service, e-mailed them a jpeg of the can, and like magic a new can came to my door! Good quality...clean, functional...quick delivery...excellent value. 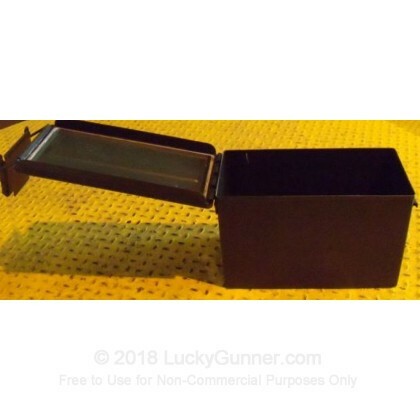 I buy all of my ammo cans from Lucky Gunner because of the predictable value and quality. No complaints. I sometimes find them for less. These are great, but they have a habit of disappearing! Got a half dozen to store powder, primers and ammo. My brother in law grabbed one, my son wants one for Christmas and my wife thinks it's super that all the explosives are now safely sealed in cases. Guess that says it all, everyone likes them...should have ordered more. Perfect fit for 1000 rounds of 9mm boxed ammo. Throw in a pack of silica and you're good to go. Cans and seals were in very good condition. Great deal for the $. I ordered 3 as a trial and will be ordering more in the near future. I got the last 2 when I ordered! Fast delivery and in better shape than I anticipated. Very pleased and recommend. Bought 1 ammo can. Based on the quality of the 1st, bought 10 more. One of the ten was bagged up (bent) beyond usable (my guess got beat up during shipping). Contact LG and they promptly sent a replacment, no charge. A couple cans had slight rust but nothing I am concerned about since I plan on keeping them indoors thus should last 4-ever. Seals on the cans are still in great shape. Purchased a dozen, shipping was FAST (as usual from Luck Gunner), and I am ordering 12 more. That should tell you how much I like this deal. All received are in like new condition - only requiring a light wipe down with Windex on a rag to remove some surface dirt. Thumbs up to Lucky Gunner! I bought 3 of these ammo cans,they are what they say the are,used but in very good condition.I'll buy more. Like new condition, can't go wrong. Fast delivery, arrived in good condition, cost excellent. First time to order from this company. Good fast service. Very good pricing. These Ammo Cans are in really good condition, not new, but better than almost any I saw while in Service. Have used for several months, and they do what Ammo Cans have always done. Store ammo and make it easy to move around! Ordered 4 of them site unseen. All were good condition, latches work good, no rust or bad metal. Have ordered Ammo since these, and same results. Good quality, good price, fast delivery. If you're looking for ammo cans, buy these!! Great cans, great price, great value. I bought 10; and one was damaged, reported on Saturday; a new one showed up on Wednesday. Some had some rust, but for $20 for a new one on CheaperThanDirt, I'll do some painting! Just as stated "like new", I have seen others selling for "used good codition" for twice as much. Arrived sooner than promised date. Fantastic product!! Quick and easy transaction. My son requested an ammo can for a Christmas present to keep his ammo secure. I wasn't able to find any locally that I knew he'd like. 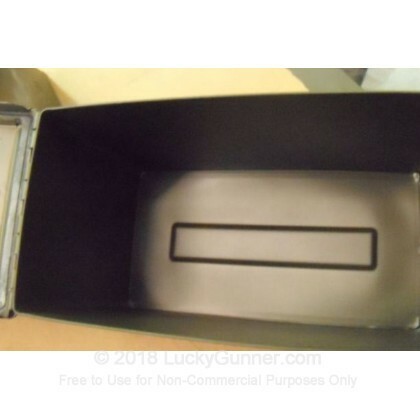 My search led me to Lucky gunner and I was so impressed with what they had that I ordered two ammo cans. I am completely satisfied with the product, and I can't wait for my son to open them at Christmas. Will do business with Lucky Gunner again. As always, LG comes through. Great value and like new ammo cans. As always, you cant go wrong with Lucky Gunner. Considering how they are $20 new; a few hours of painting will be worth saving $120+. i gamblede on the description and ordered a dozen and they were as advertised. Quick delivery and just as advertised. Second order of this item; first was just as quick and satisfactory. Great cans in good shape. No rust and seals in place. I have used a lot of Ammo Cans for over 55 years. Earlyer ones cost $1.00 each. Everything from 30 Cal to 80mm. The cans from this site is in great like new condition. I bought 10 already and plan on buying more. After all you get what you pay for and they will last for years to come. I have used one for over 50 years as a tool box for my cars. Wish the cars had last that long. Great Product! These ammo cans came very quickly and arrived in perfect shape. They seem to be in unissued condition and work well. Lucky Gunner seems to be an excellent, well run, company. I bought six based on the reviews and am very pleased. The boxes are not new, but they are lightly used with minor paint scrapes and very light rust in just a few small spots. The rubber seals are still pliable and the inside of the boxes are immaculate and almost look unused. The stenciling on the outside of my six boxes had been sprayed over with a light coat of paint but some lettering was still visible. I'm impressed enough that I plan to buy a few more for non-ammo storage purposes. 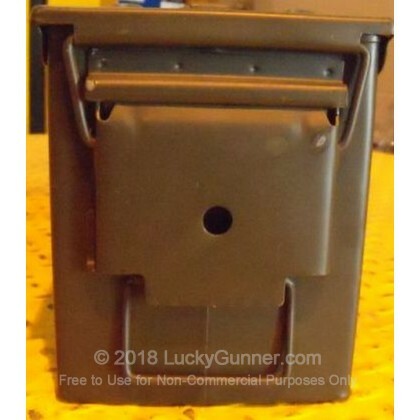 I have purchased a total of 5 ammo cans from Lucky Gunner and am completely satsified with the product. The ammo cans were shipped promptly and exactly what I ordered. I will definitely order more as I need them. They are great for keeping a large amount of ammunition secure and dry. I love Lucky Gunner and can always find a great deals on the website! Good price, and I was surprised at the speed of delivery. Need to order more. These are the absolute best ammo cans anywhere. Looks brand new and the price is fantastic. Fast shipping and well packed. LG hits another one out of the ball park. Well done. purchased 4 cans (and are almost like new) sturdy with a great seal! Highly recommend. Very satisfied with product, have never seen faster shipping. Ordered int he afternoon order was here the next day. I have used a lot of Ammo Cans over the pass years. Everything from 9mm to 80mm. Spent a year in Iraq and a year in Afghan. I tell ya those cans were used and abused. The cans from this site is in great like new condition. I bought 10 already and plan on buying more. I would rather pay for a great can then get a beat up can for free. After all you get what you pay for and they will last for years to come. If you plan on storing Ammo, Primer, Casing, Bullets, or even personal belongings, adding a Silica Gel Desicent Pack will prolong the the life of contents 2-3 times longer and the rubber seal in these ammo cans is what helps that prolonged life. Great Product!!! Excellent condition. Store your ammo like the military. Will buy more soon. Good deal on great condition 50 cal. ammo cans. YOU MIGHT AS WELL GET 1 ANYTIME YOU ORDER AMMO. THEY PUT YOUR AMMO IN IT FOR SAFE SHIPPING AND YOU CAN USE THEM FOR EVERYTHING !!!! This are almost new. Great item and great service again. Why buy the cheap, plastic Cabela's cans when you can get these for almost the same $$$$? I ordered and received 10 cans in excellent condition with still positive flexible seals.The delivery was right on time and the packaging war very protective. Purchased 10 of these on a recommendation and was not disappointed. These are like new and the gaskets must be new. These hold ammo well and anything else you can imagine. Very good sealing properties and will probably buy more. The second group is as good as the first! The Cross country shipping was quick and all was packed extremely well! All of the cans I recieved were near new and you can't beat the price even being shipped across the grand ole U.S.A !!!!!! Buy 10 or 20! well worth the price! great delivery and service 101 uses for these! I order 10 of the cans. The price and quality were great. The only more I could have asked for is for them to been filled with the ammunition I use! They were as advertised, like new. I have now purchased three of these cans for ammo storage. In both shipments, the quality of the product was outstanding. Seals and paint were excellent. I use these for storing my different types of ammo and use duct tape on the handle to categorize each type, i.e. 12 Ga. slugs/buck, 12 gauge target/game, 9mm target, 9mm 147 gr. (Steel Plate) etc. For serious shooters, this is the way to go. No more thumbing through cardboard boxes on the range, just empty the factory boxes into these (and add their Silicone Gel Packs for moisture protection) and you are ready to go when you arrive at the range. Each of these will store 1,000 rounds of loose 9mm ammo or 200+ rounds of 12 gauge. Easy to carry. I bought one of these and then went back for more. they are just like brand new, even the gaskets are like new. These boxes will last forever. Could even bury all my mnon-existent money in them and come back in a hundred years and find it like new. Lucky Gunner strikes again with great products! Great product and price. Fast delivery, will order more. Listen...these are the BEST quality ammo cans on the market at this price...period! Excellent condition...almost new. I took a needle nose bottle of Breakfree CLP and put a bead of it around the rubber gasket. Wipe clean and voila....new and conditioned rubber. Totally happy with LuckyGunner. These cans really are like new. It's nice to find a vendor that describes a used product in an accurate manner. The whole process with Lucky Gunner was very smooth. I have ordered several of these cans from LuckyGunner, and I have to say, they are always in great shape when they arrive. Understand these are surplus and will not be factory new. That said, they are in almost new condition and still hermetically seal flawlessly. Throw in a bag of desiccant with your ammo, lock the lid and you're good to go for years of dry storage. I ordered three cans and they were exactly as described. Mine where in almost new condition. I plan on buying more! Nothing wrong with this box. Well constructed and clean. I'll buy more as needed. Canisters are very well built and the seal is tight and secure. Will definitely be purchasing more of these. Awesome ammo can and service. You cannot beat this 12 buck can! If I were Lucky Gunner then I would have my logo painted on it for free advertising. No dents and very good seals. I was very pleased for $7.00 and i bought 10. They come in a short period of time and was packed very well also. Top notch product and service. This was my first order from Lucky Gunner. I wish I would have bought more of these as they are perfect size for 100 round box of 2 3/4 inch 12 guage shells and room to spare so you could probably fit 150 rounds of shells in this box. I also purchased the "Silica Gel Desiccant - 5 Gram - Cotton Packet - 10 Packets" to keep the ammo dry. The ammo can was like new with good seals and paint. Much better product than you can find at your local surplus store. These are practically new. Minor scratches and such. What can I say... cans are in mint condition, maybe a little cardboard rash from the box, but a fantastic value. I bought all I'd need for a while, but I'd get more in a heartbeat if I thought I could use them! Fast shipping, excellent condition will buy again!! Very pleased. Cans are Like New. Shipping & packing Second to None. Received in two days in 3 well packed containers. Customer Service was superb with telephone follow-up on my questions. You folks are the BEST!!!!! Ordered 10. Great condition for used cans. Good seals, no dents, some stenciling on sides. Can't be beat for the price. Lids and handles are solid and hinge is not sprung or bent. These are in amazing condition and they arrived 36 hours after I ordered them. Great Service! Quality ammo cans at a great price. I ordered and received 6 of these cans and am quite satisfied with my purchase. Cans are as advertised, with minor scratches, but no dents, and painted over content markings. Important thing is they are fully servicable and a great buy at these prices. Get them while you can. Excellent quality, fast shipping - could not ask for better service or a better value. I have already placed a second order. They really are like new. No dents or rust. Well you open them up and they sure smell new, like a new car tire! seals are water tight, no rst, dings or dents. Buying more when I can afford to. Picked up 12 as they are such a great deal. Best quality and price around for ammo cans. They are as close to new as you can get. I wish I need more so I could purchase them! Would not describe as "Like New"
The ten M2A1 ammunition boxes received I would not describe as "Like New" for the condition. The boxes are in excellent used condition with minor surface rust and "Empty" markings. When you consider the $10.00 per box delivered cost, this is an acceptable product. The 6 i ordered all arrived in perfect shape.No dents whatsoever, only minor rust on 1 can.. I could have not hand picked a better lot from a gun show....WILL be buying more soon..! High quality for a used product. 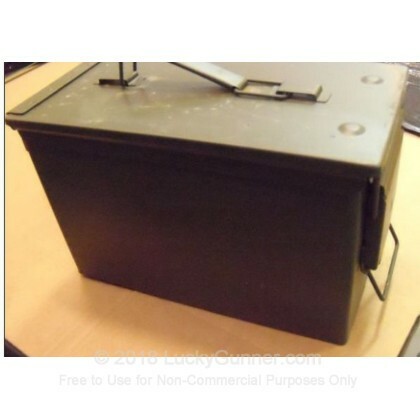 Purchased 4 ammo can's, received exactly as described, like new. Minor scratches and undercoat shows previous symbols and numbers. Pretty cool looking. 1 lid came off but I re-adjusted it and it's fine. Price is right! I put 1000 rds. of 9mm and it only filled half way. Good buy! Purchased 10 of these beauties. Fast Shipping Friendly Service. Going on my second purchase. A quick cleanup and your good to go. 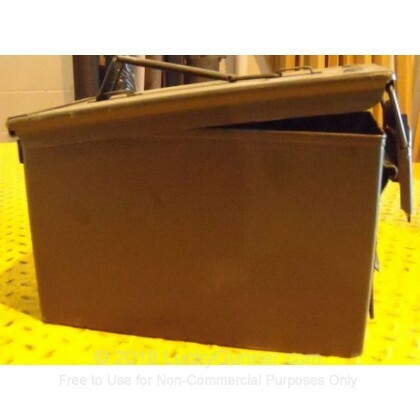 GREAT CONDITION AMMO CANS! Excellent quality with plenty of room for ammo. Can't beat the price! They took 5 days to arrive and were well worth it. For that price, I purchased 4 ammo cans and just put 1000 rounds of 9mm in one can. Didn't even fill 1 can half way. COOL! I was pleasantly surprised with the quality of this used ammo can. Many local stores sell the same type, also used, for a few dollars more but the quality is not as good. Will buy again. cans as described, very good condition with "empty" stenciled inside and on end. terrible smell inside when first opened. It took a couple of days leaving them open outside for it to dissipate to acceptable levels. Even considering shipping costs they are a good value for the price. I bought ten of these ammo cans...best cans I have ever seen...all just like new! thinking about dumping the old ones I have and replacing with these they are so good...shipping is high at a little over 30 bucks but I guess that is not Heidi's fault!. Shipping was fast. I ordered six cans late Friday afternoon and they arrived today (Wednesday). The cans are in excellent condition, both inside and out. The inside of each can is completely clean and the seals are in perfect condition. The lettering on the outside was painted over, but the original paint is in great condition. There are no dents in the cans. Lids and latches are in perfect working order. And the price was great! I was so impressed with the product quality and Lucky Gunner's customer service that I ordered 4 more cans tonight. Just like everyone else here... it came in undamaged and working.. I would buy from them again.. Excellent! If you need them buy them! Excellent ammo cans in great shape. Great value for ten even when shipping across the country! Very quick delivery to boot! Excellent experience!! Thanks. They are quality cans and in really good condition, although mine smelled like somewhat ripe seafood. Having said that, I am happy with the purchase. i wish i had two more for my 500 rounds of 7.62 ammo. The four I just got today are full: 2200 rnds 9mm, 750 rnds 38 special, over 1000 rnds 22LR and a dz. 357 magnums and 60 rnds 7.62. These hold a lot. This is the place to buy! Fast Shipping --Great Service! Cans are in great shape (better than anything available locally) and are a great value for the condition. This is my first experience with Lucky Gunner...it will NOT be my last! I added one of these w my last ammo order and my only regret is that I didn't toss in 3 or 4 more. They are perfect storage for ammo and make a nice transport to the range. Will get a few on my next order and recommend the same for anyone with more than a couple boxes of ammo. The cans arrived as described and undamaged. Excellent product. Would buy again. Great value,great condition,fast shipping,you can not go wrong with these,ordered 10 to split with my bud, wanted to keep them all. I will need to order more soon! These cans were perfect! Just exactly want i was looking for & and a great price!! Thank you! Great item - would buy again. Look brand new - ideal for storage of ammo and other items. The ammo cans were in great shape with the word empty spray painted on the outside of the cans. The only down side is my cans were from the mid 1980's and the smelled like sea food. Other than that they are excellent cans! Great cans in great condition. Excellent price for ten, even with the shipping cost across the country. If you need them, get them! Thanks! The cans I received arrived the day after I ordered them and were packed well. The cans were stenciled in white with the word "EMPTY" on one end and inside on the bottom. Spray paint covered up the original stenciling which was "N285, 8 FUZE MTSQ M577A1, LOT HAT86J021-018,LOADED 9-86". I used "Goof Off" to remove all the stenciling and extra spray paint. No rust. Hopefully the seals will last another 25 years. bought some from other company but were not in these good of condition. will buy more!! Best price I could find even with shipping. The only con - Not exactly "Like New"
The ammo cans were in great shape, high quality. The shipping was fast and the price was among the lowest I have noted on the internet. Keep up the good work. As discribed. Only thing that could have made them newer would have been wet paint. These are getting hard to find. These cans are excellent and for the price you can't go wrong. Thanks. THESE ARE GREAT FOR STORING MY AMMO IN. I INCOORPERATED A HASP AND LATCH ON THEM AS TO KEEP THEM SAFER WITH A LOCK. Price was right for quantity ordered compared to local market; the plus factor: shipped to my door. The ones I got looked like they had not been used. Cans arrived in very short order, and the price was excellent. One out of four had some rust. I bought 3 of these cans. All are like new. Ammo cans arrived in excellent condition! Good quality cans for ammo storage. I ordered them on a Monday morning, UPS brought them to my door on Tues. that's fast! I purchased 10 of these at $7.00 each. With shipping it came to $100.00. I could not find them in my area for less than $10.00 each, so it made economical sense to get them. The cans were in excellent condition but smelled a little funky inside until I aired them out. Shipping was fast. Overall, I am very satisfied. Overall, great cans for the money. Condition of my 6 cans was good to go. Needed no cleaning and seal was clean and not torn. Ammo cans were received in a timely manner and in very good condition. Ordered 3 of these. They look brand new and function perfectly. Some thing was all over it. I had to clean it up. This is great my ammo is very secure no mildew> Don't have any problem with them. This is a great box for anything. Can arrived in excellent condition with a very good seal. These are ideal for storing boxes of ammo in since the width is ideally suited for standard 50 round boxes of ammunition. tight seals. good latches. virtually perfect.